Over 3,000,000 downloads of this material so far! NAABT "Recovery is About Change"
If the process of addiction recovery could be summed up in one word, it would be change. Without change there is no recovery. Recovery from addiction is not achieved through the passage of time, nor taking a treatment medication, nor attending meetings. These are simply tools to help make profound changes in behavior and thinking. Understanding this provides the map necessary to navigate a successful recovery. matters, the purpose of counseling, therapy, support, and treatment medications. What is it? How to prevent it. 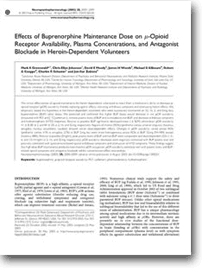 A must read for every patient before beginning buprenorphine treatment. Page 2 is the COWS (Clinical Opiate Withdrawal Scale) to help in gauging withdrawal symptoms. NAABT "The Words We Use Matter"
By choosing language that is not stigmatizing, we can begin to dismantle the negative stereotype associated with opioid addiction. Explanations of why certain words and phrases are stigmatizing and suggestions for alternate, non-stigmatizing replacements are suggested as a start in reducing the stigma associated with addiction. PowerPoint slides of this can be downloaded as well. The "Bowling Ball" analogy, written by Dr. Richard Gracer. "The Meaning of Peer Support. What is it? Expectations" discusses different types of peer support, and how it differs from therapy and the other components of a complete recovery plan. This important addition to a patient's wallet includes spaces for not only important contact numbers for the patient, but also important resources for healthcare workers unfamiliar with buprenorphine. 4"x9" in size, side one is a brief description of buprenorphine, side two is an explanation of the NAABT patient/physician matching system. 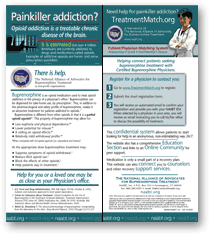 The NAABT Patient/Physician Matching System (PPMS) confidentially connects patients with participating certified buprenorphine-prescribing physicians. 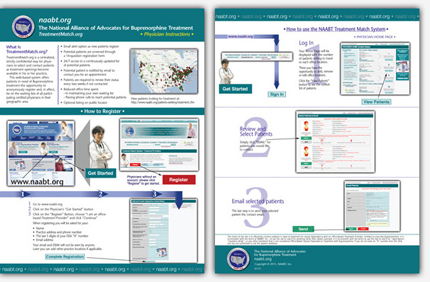 This instruction sheet shows how to register and use the system to contact patients seeking buprenorphine treatment. 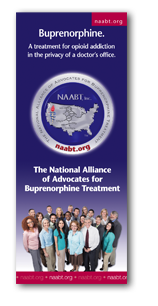 The most downloaded item on naabt.org: TIP 40: Clinical Guidelines for the Use of Buprenorphine in the Treatment of Opioid Addiction. 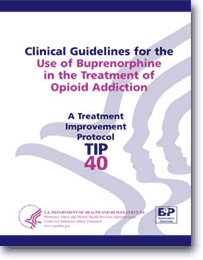 This best-practice guideline for the treatment of substance use disorders provides consensus- and evidence-based guidance on the use of buprenorphine for the treatment of opioid addiction. 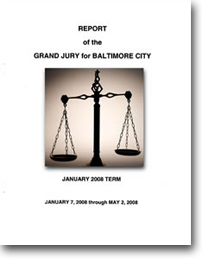 All TIPs are available directly from the US Health Department in PDF and hardcopy form. 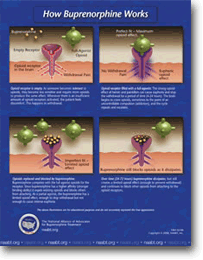 NIDA "The Science of Addiction"
Released February 13, 2007, this NIDA (National Institute on Drug Abuse) 30-page full-color booklet explains in layman's terms how science has revolutionized the understanding of drug addiction as a brain disease that affects behavior. 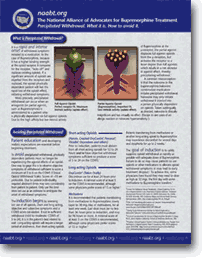 NIDA hopes this new publication will help reduce stigma against addictive disorders. 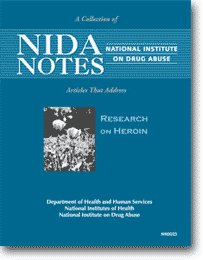 This NIDA Notes Series "A Collection of articles that address Research on Heroin (NN0023) contains 17 studies and articles about heroin addiction, and the treatment of, including buprenorphine treatment. 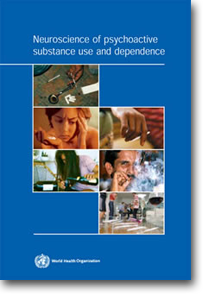 WHO "Neuroscience of Psychoactive Substance Use and Dependence"
This World Health Organization comprehensive scientific book on addiction includes basic neurobiology and specific information about various substances. 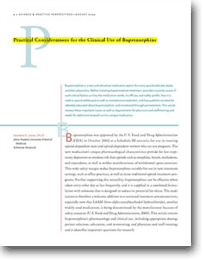 "Practical Considerations for the Clinical Use of Buprenorphine" August, 2004. 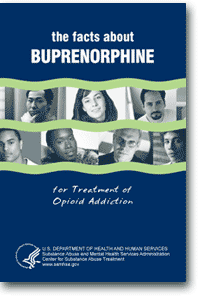 Written by practicing certified buprenorphine physicians, the guide provides a real world assessment of the methods and issues with using buprenorphine in an office based environment. 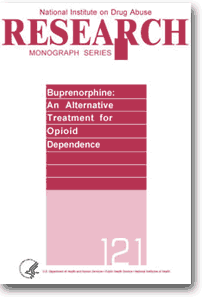 This 1992 "Buprenorphine: An Alternative Treatment for Opioid Dependence" monograph is based on the papers and discussions from a technical review on "Buprenorphine: An Alternative Treatment for Opioid Dependence" held on March 16-17, 1989, in Rockville, MD. sponsored by (NIDA). "The Neurobiology of Opioid Dependence: Implications for Treatment" 2002 "Opioid tolerance, physical dependence and addiction are all manifestations of brain changes resulting from chronic opioid use and misuse. 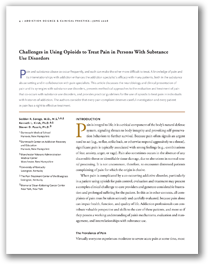 The patient's struggle for recovery is in great part a struggle to overcome the effects of these changes..."
Pain and addiction co-occur frequently, and each can make the other more difficult to treat. 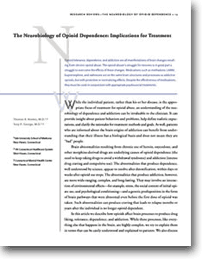 This article discusses the neurobiology and clinical presentation of pain and its synergies with substance use disorders, presents methodical approaches to the evaluation and treatment of pain that co-occurs with substance use disorders, and provides practical guidelines for the use of opioids to treat pain in individuals with histories of addiction. Privacy is a big concern. 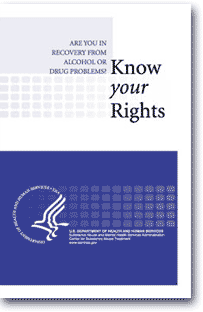 This publication covers special privacy rights afforded to patients with addiction. Privacy is a big concern. 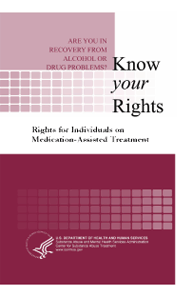 This publication covers special privacy rights afforded to patients specifically utilizing MAT (Medication Assisted Treatment). It is illegal to deny housing based on MAT. 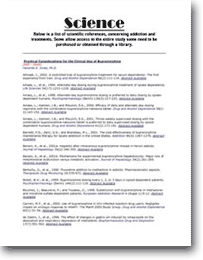 Bibliography of major scientific publication with links to many study abstracts. A great place to start when looking for very specific research or information. 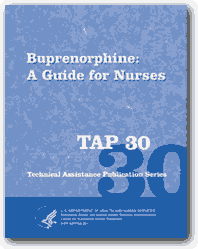 This guide is intended to provide nurses with general information about buprenorphine products for the pharmacological treatment of opioid addiction. What's in a word? 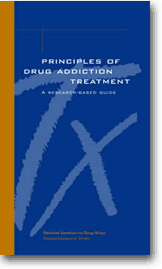 Addiction Versus Dependence in DSM-V - CHARLES P. OBRIEN, M.D., PH.D., NORA VOLKOW, M.D. T-K LI, M.D. 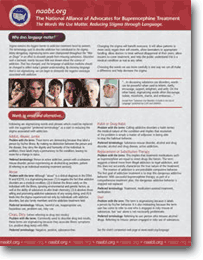 Substance Use Disorders: A guide to the Use of Language. Rev. 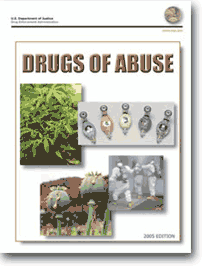 4/12/04 This guide was prepared by TASC, Inc. under contract for the Center for Substance Abuse Treatment (CSAT), Substance Abuse and Mental Health Services Administration (SAMHSA), part of the U.S. Department of Health and Human Services (DHHS), 2004.